Scunthorpe narrowly beat Somerset Rebels 92-91 on aggregate to win the Premier League title. The Rebels, who won the League Cup last week, held a five-point lead going in to Monday's rearranged second leg at Eddie Wright Raceway. But the Scorpions overcame the deficit to win 48-42 on the night and seal the Championship. "It was always going to be a top meeting, and so it proved," Scunthorpe promoter Rob Godfrey said. "Hats off to Somerset. They came, rode it better than they ever had before, and pushed us all the way." It was a close encounter throughout and it was not until heat seven that Scunthorpe put themselves into the overall lead. 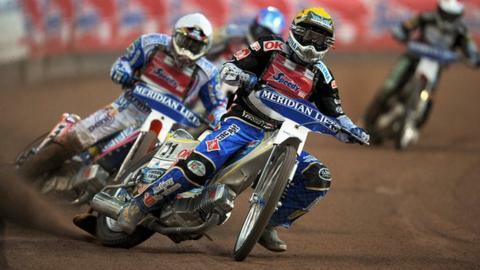 But the Rebels hit back and they held a one-point aggregate lead going in to the final three heats. Scunthorpe claimed a 4-2 win in heat 13, and a share of the spoils in the penultimate race meant that Somerset needed a heat advantage in the final race in order to take the trophy. Nick Morris and Josh Auty kept Rebels guest Richard Hall at bay to ensure the Scorpions edged the victory. Somerset promoter Debbie Hancock said: "Obviously we are disappointed not to be champions. "We gave it our best shot and I could ask no more of our riders but unfortunately it wasn't to be. Somerset fans should feel rightly proud of the way the team performed, not just in the final but over the season as a whole."